When I first started doing project-based learning, I saw it as a tool for teaching the 30+ students in my classroom in a more authentic way. I wanted to make connections to their home life, while showing them that the skills they’re learning in school have a real purpose. It didn’t dawn on me that PBL could actually be used at home until some of my friends started homeschooling their older kids using some of the same projects that I used with my class. When I began working with people in my Project-Based Learning Club and the PBL Facebook group, I got to know even more people that were trying out PBL with their kids at home. That made me ask: Why is this popular with homeschoolers? PBL allows them to sneak in the learning. Kids, especially older ones, prefer the format of a fun project over worksheets. The real-world format allows them to connect the work with day-to-day life. Doing a PBL where you plan Thanksgiving dinner or plan a party can be used to connect math skills to something that your family is actually doing. PBL allows you to teach your kids different skills without the struggle of direct instruction. Many homeschoolers have told me that they have a child that is resistant to direct teaching from a parent. This can often be the case with kids that start homeschooling at an older age because of issues at school. It works with kids that have special needs or learning disabilities. One of the great things about homeschooling is that you can give your child as much, or as little, help as you need to on the project. You can build in the skills that your individual child needs to work on. The best thing about the PBL + homeschooling combo is that you can provide your kids with the real life skills that they need to function as an adult. You can use it to teach them how to handle their finances, manage a business, and even plan a family vacation. Project-based learning is a learning method where kids gain and apply skills by working on a long project where they complete an in-depth inquiry into a specific topic or question. Like all methods, it’s not standalone. It can be added to any homeschool curriculum or activities you are presently using. PBL allows for more real world application and in-depth understanding of concepts in math, language arts, social studies, science, art, and business. Significant Content – At its core, the project is focused on teaching important knowledge and skills, derived from key concepts at the heart of academic subjects. This content will be provided by the homeschooling parent via materials such as books, online materials, and conversation. 21st century competencies – Kids build competencies valuable for today’s world, such as problem solving, critical thinking, collaboration, communication, and creativity/innovation. The technology you already have in your home is sufficient. In-Depth Inquiry – Kids are engaged in an extended, rigorous process of asking questions, using resources, and developing answers. This ties into the materials you provide to help them explore the content and is research-based. They can also complete research out in the real world. If the PBL involves planning a Thanksgiving dinner, take them to the grocery store for part of their inquiry. Driving Question – Project work is focused by an open-ended question that kids understand and find intriguing, which captures their task or frames their exploration. Begin with a driving question that relates to your family like: How can our family plan a vacation that excites everyone and stays in our set budget? Need to Know – Kids see the need to gain knowledge, understand concepts, and apply skills in order to answer the Driving Question and create project products, beginning with an interesting project-starter that generates interest and curiosity. This means to involve your kids in your day-to-day life activities. Voice and Choice – Kids are allowed to make some choices about the products to be created, how they work, and how they use their time, guided by the parent and depending on age level and PBL experience. Once you set up the basic structure of the PBL, let your child make decisions based off of their preferences and interests. Critique and Revision – The project includes processes for kids to give and receive feedback on the quality of their work, leading them to make revisions or conduct further inquiry. This can be done with other family members, or other homeschooling families. Public Audience – Kids present their work to other people in their family and community. Homeschoolers that have contacted me in the past have had one main concern: Finding PBL resources to use with their kids. There are many great resources out there for project-based learning, but there aren’t a lot out there labeled specifically for homeschoolers. That’s because project-based learning is an excellent option for both classroom teachers and homeschoolers. Every resource you find online has to be modified for different classrooms, and the same goes for the homeschool classroom! To get ideas for project-based learning activities, try joining my PBL Facebook group. There are teachers and homeschoolers sharing ideas and collaborating together. We all have the same goal in mind: Getting ideas that we can alter to fit the kids we serve. Don’t be discouraged when you see project-based learning that mentions a traditional classroom setting or state standards. In my math-focus projects, I list the Common Core standards because that’s what most states use and I want to be as specific as possible for teachers trying to use them in the classroom. They do not have the amazing flexibility that homeschoolers have! I have many homeschoolers that use my PBLs with even more success than the classroom teachers because they can get out into the real world and make it an even more authentic experience for their child. In my PBLs, standards are listed in connection with the skills used in the project. The state standards denote specific skills, not how to teach them. It’s always best to focus on the skills used and the merit of the PBL and not get hung up on it not being labeled for homeschool. The same goes when you’re reading ideas online from any other website on project-based learning! Remember that teachers use these activities to reach students that are like your child. As a homeschooler, you have the advantage of tailoring the activity even closer to your child’s interests and abilities. Do you have a family budget? 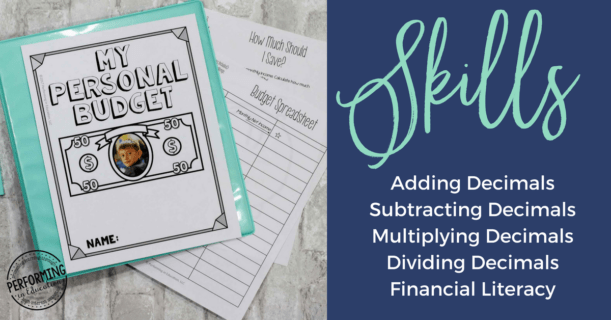 Have your kids learn decimal skills by making them a part of your budgeting sessions. Include them by letting them look at bank statements, use money apps, and more. Below is a PBL I do with my students that would be even more effective in the homeschool environment. The best way to come up with activity ideas is to look at what you’re already doing at home. Ask yourself what skills you want your kids to learn and combine those life skills with the academic ones at their level. They’ll love the format of PBL, and you will too! If you’re a homeschooler that is interested in PBL, or has tried it, I’d love to hear from you! Join our Facebook group and tell us about you and your kids!